Guests at the wedding of Steven and Samantha Wheeler always knew this was going to be a big day with a difference. 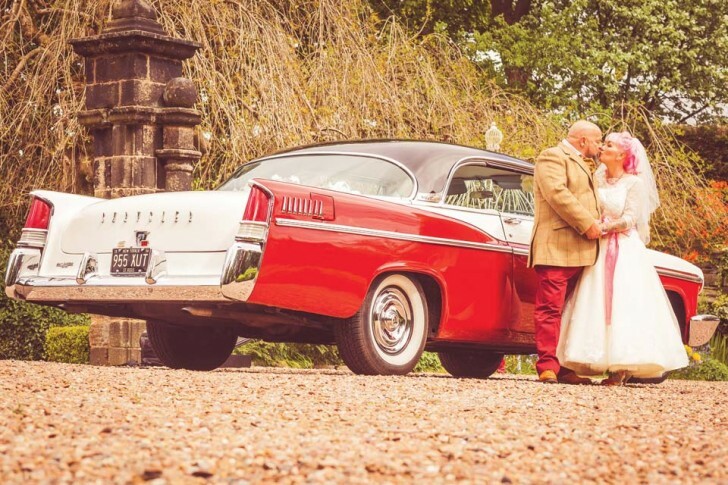 Their wedding earlier this year on May 24th certainly was different – it had a 1950s theme throughout, right from the outfits to the cars to the entertainment. 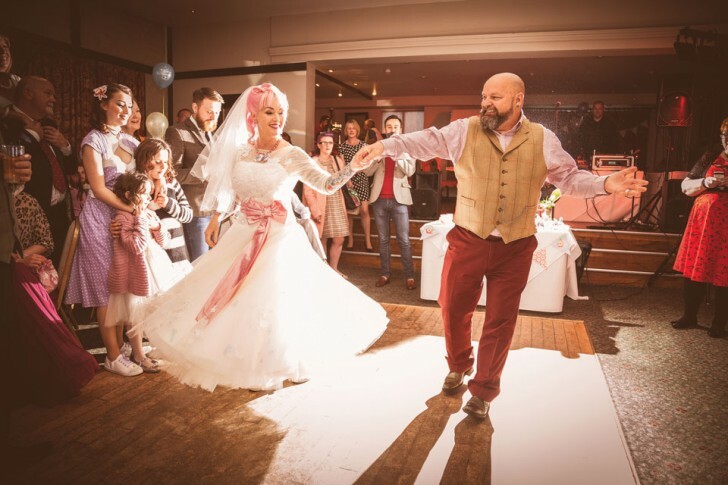 For the ceremony at Coley Church, the bride wore a 1950s style tea dress made by a friend which had lace detail, petticoats, Swarovski crystals and a pink sash. Her bridesmaids wore 1950s inspired dresses, all in different pastels colours. The bouquets were made from buttons by the bride. Bridegroom Steven and his party arrived for the ceremony in 1950s American Chrysler cars in keeping with the theme of the day. 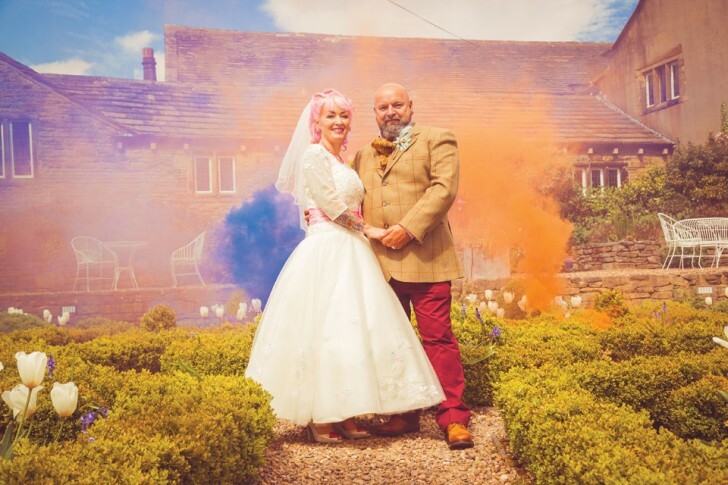 Luckily the sun shone for Steven and Samantha and they were able to have photos taken outside – with the addition of smoke affects to create some really unusual photographic memories. 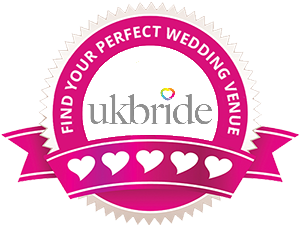 After the ceremony, the wedding party moved to the grand surroundings of Holdsworth House in Halifax for a Pimms and canapes welcome before the 80 guests sat down for a three-course wedding breakfast. Later more guests joined the couple for an evening party and buffet. The couple’s three tier wedding cake was decorated with buttons and had two Minion figures on top to represent the bride and groom. 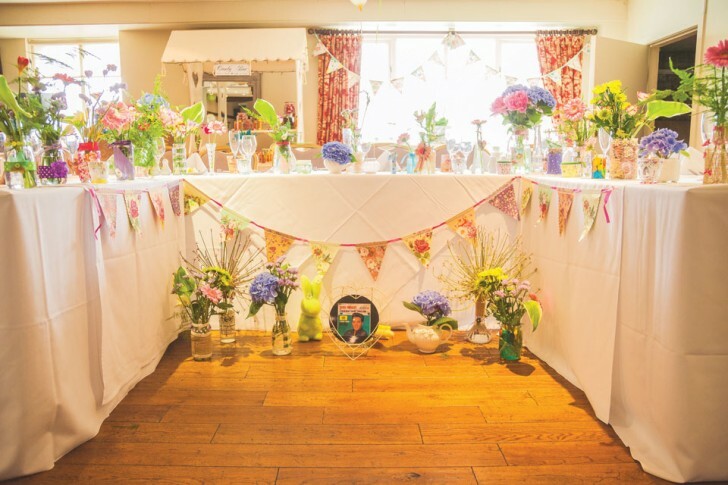 Tables were decorated with jars of flowers and each guest received a favour containing a tea bag, a prayer card and a postcard on which they could leave a message for the happy couple. The evening celebrations included an Elvis tribute act which went down a storm and was the icing on the cake for a great day. Following the wedding the couple enjoyed a fabulous two-centre honeymoon in New York and Las Vegas for two weeks. Now the couple are back at work – Samantha works with people who have learning difficulties and Steven owns two tattoo parlours in Halifax. The couple live in Halifax.